Posted on March 17th, 2010 in Strange Attractors, Tech Notes. 1 Comment. 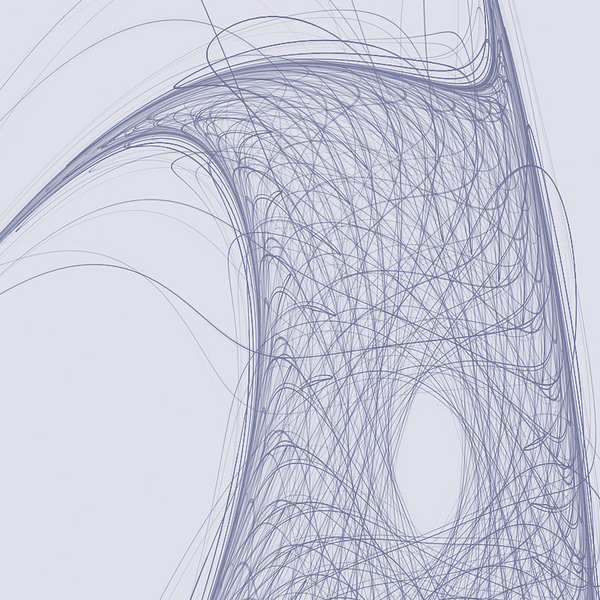 I first generate my strange attractor artwork with a custom program written using C++, OpenGL, and GLUT. The basic algorithm I use for generating the attractors is set forth in Clifford Pickover’s Chaos in Wonderland; the equations I use are iterated functions that plot between a hundred thousand and a few billion pixels, depending on the final size of the artwork. I colorize the attractors using gradient mapping in Photoshop (the initial renders are 16 bit grayscale images). The appearance of the attractor is determined by its mutation (which equations it uses) and its two to four coefficients. I have structured the program so that it is easy to explore various forms of the strange attractor in real time by moving sliders, clicking buttons, picking different color gradients, and rotating, panning and zooming the view. When I find an image I like, I save its parameters and render it later at high resolution. I then bring the images into Photoshop to adjust color, composition and contrast. Special thanks goes to Marty Altman, Scott F. Hall, Matt O’Connor, J. Michael Moshell, Lorraine Lax, and Paulius Micikevicius for their suggestions along the way. At this point I don’t have a version of my program for public release, but please let me know in the comments what other details you are interested in!